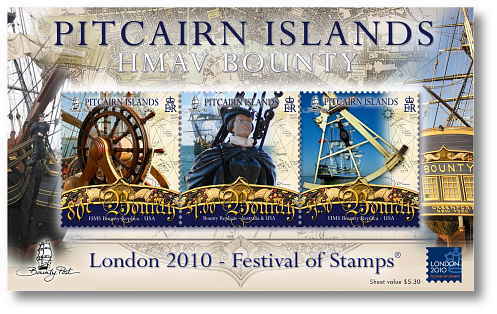 From May 8-15th May 2010, the Pitcairn Islands Philatelic Bureau attended the Exhibition in London. Meetings were held with the Pitcairn Study Groups, the Polar Philatelists, several postal administrations and stamp agents. It was a pleasure also to meet in person many of our customers who visited our stand and introduced themselves. The Bureau produced a commemorative miniature sheet featuring 3 stamps from our current definitive Bounty issue. We are enclosing this sheet with the WWF issue for those with miniature sheet standing orders. If you do not have a standing order for mini sheets and wish to receive this, please purchase online here.